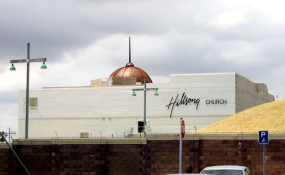 Armed robbers targeted the Hillsong Church in Century City, Cape Town, on Monday and have yet to be arrested. "According to information, two suspects, one armed, entered the church and robbed the employees inside the premises of their cellphones," said Sergeant Noloyiso Rwexana. Western Cape police clarified that it was not a hostage situation, as had been claimed on social media. Rwexana said the incident was under investigation. A photo doing the rounds on social media showed an armed man on the roof.